Surprising to some, the number of Americans with missing teeth is in the millions, making tooth loss common among adults. What’s more, many individuals across the country are missing all of their upper and/or lower teeth. While traditional dentures are a suitable option for some, others are turning to “all-on-four” implant dentures. Perhaps you are unfamiliar with the process of placing a dental implant. To better understand, an implant is a small titanium screw that is surgically placed inside the jawbone, replacing the root-portion of a missing tooth. After some time, a dental crown is positioned over the top of the implant to create a natural-looking prosthetic tooth. With continued advancements in digital dentistry and new-age techniques for replacing missing teeth, the all-on-four system doesn’t require a dental implant for each missing tooth. Rather, only four implants are needed on the top of the mouth, and four are needed on the bottom. This means that four precisely placed implants restore a full arch of teeth on the top and bottom, which is the beauty of all-on-four implant dentures. 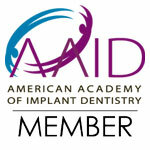 Specifically, two implants are placed vertically, while the other two are inserted at an angle. Not only does this provide better arch support, it is an excellent choice for patients that have limited bone structure. Furthermore, as each implant fuses with living bone in the jaw, this creates a strong foundation for an individual’s new smile. In essence, the bone is stimulated and bone atrophy is prevented. Finally, with bone loss no longer a concern, an individual’s facial structure and unique contour are preserved, creating a youthful appearance. In regards to appearance and function, all-on-four implant dentures are unrivaled. Yet, as an added benefit, this innovative dental restoration can be completed in one day. Dr. Dalla and the team at Ora Dentistry understand the negative impact of missing teeth on one’s oral and overall health. We also realize that missing teeth can dramatically affect one’s emotional and physical well being. That’s why we offer exceptional options to restore a patient’s smile, such as all-on-four implant dentures. To schedule an appointment with a highly experienced restorative dentist in Elk Grove, call Ora Dentistry today.